Lovers of peanut sauce rejoice I think I have finally found a recipe worth keeping. It tastes like the peanut sauce I have only been able to find in Asian supermarkets that I can never read the ingredients on. Don’t panic if you don’t have much time for marinating but you should aim for at least 20 minutes at the minimum. Next time I make this recipe I think I am going to add some ginger and honey to the marinade. Best served with a nice fluffy rice. Enjoy. Thoroughly whisk together ingredients for marinade (except olive oil) and marinate sliced chicken for 30 minutes at room temperature or 1-2 hours refrigerated. While chicken is marinating, thoroughly whisk together ingredients for sauce in a small bowl; set aside. Heat 1 tbs. oil in wok (or large skillet) at medium-high heat. Drain chicken and cook for 10 minutes or until no longer pink. Set cooked chicken aside, covered. Reduce temperature to medium heat and heat 1 tbs. oil in wok. Cook vegetables for 10 minutes or until tender but crisp. Return cooked chicken to pan and toss with vegetables. Make a well in the center of the wok and pour sauce into it, stirring constantly. The sauce will thicken slightly. If the sauce is too thick to your taste, add water a little at a time until desired consistency is reached. 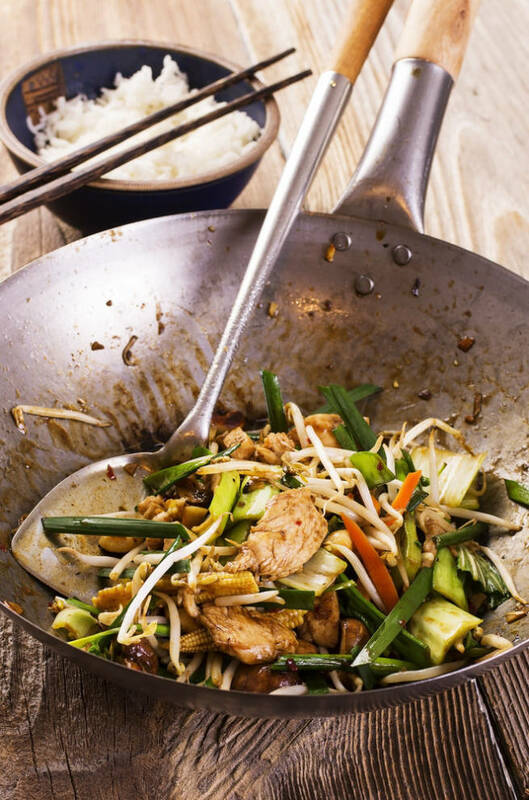 Toss sauce, chicken and vegetables in wok until sauce is thoroughly incorporated. Serve over rice or rice noodles. Tried this tonight. Sauce was MUCH thicker than in the photo. I would consider less peanut butter maybe, the consistency was just too thick. Ahh I’m confused, this recipe does not mention the bean sprouts or the baby corn or the bok choy that is in the photo….